← Green Beans can substitute for Lentils, right? So tonight I decided to make a white lasagna with it. I harvested 5 or 6 baby eggplants from the garden, washed & peeled them, then grabbed the lone zucchini from the veggie drawer. I sliced all the veg, dropped them into a mixing bowl, dumped about a cup of flour on top and tossed them around to coat with the flour. I cracked three eggs in a separate dish and whisked with a little water. In a 3rd bowl I dumped about 2 cups of seasoned breadcrumbs and about a cup of freshly grated Parmesan (or maybe it was Locatelli…I can’t find the label anymore). I shook the veg to relieve it of the excess flour, rolled each piece in egg, then in the breadcrumb mixture. I decided to experiment with oven baking them. I preheated the oven to 375, laid out the breaded eggplants on an oiled baking sheet and the zucchini I laid out on top of a rack set inside a baking sheet. I wanted to see which would get crispier. I sprayed all with some cooking spray and put the sheets in the hot oven. I baked everything for 20min, then flipped all the pieces over and baked for another 20. Flat on the baking sheet was waaaaaaay crispier. The eggplants got more color too. In the meantime I melted butter in a saucepan, added in half a block of cream cheese and a cup of cream (Tonight I laugh in the face of Low-Fat recipes!). When the cream cheese melted down I added in basil, oregano and a pinch of thyme, as well as some celery salt and a few cranks of fresh pepper. I set it on low and walked away for 5 minutes (time to change a poopy diaper!). I came back to a slowly bubbling saucepan. I took it off the heat and stirred in the entire block of Smoked Gouda (I used the large holes on the grater to ensure quick melting). I stirred this joyful mess together and set it aside to cool for a few minutes. When the veg was all brown and crispy looking I took the pans out of the oven. Using a medium sized casserole dish I layered cheese mix, eggplants, cheese mix, zucchini, cheese mix, eggplant, cheese mix and then I sliced half a block of fresh mozzarella on top and whacked the whole shebang back in the oven for 30-40 minutes, til it was all gooey and melty and brown on top. Man oh man – this stuff is G.O.O.D. Seriously good. Hot damn good. I wanna get the good camera out to capture all the beautiful steamy goodness….Yeah…too bad I’m too busy eating! I used this recipe as a general idea of how to make a White Sauce. 2 cups (8 ounces) shredded cheddar cheese **I didn’t use any cheddar tonight. 1- Stir the cream, cream cheese, basil, oregano, Italian seasoning, salt and pepper; cook and stir over low heat until blended. 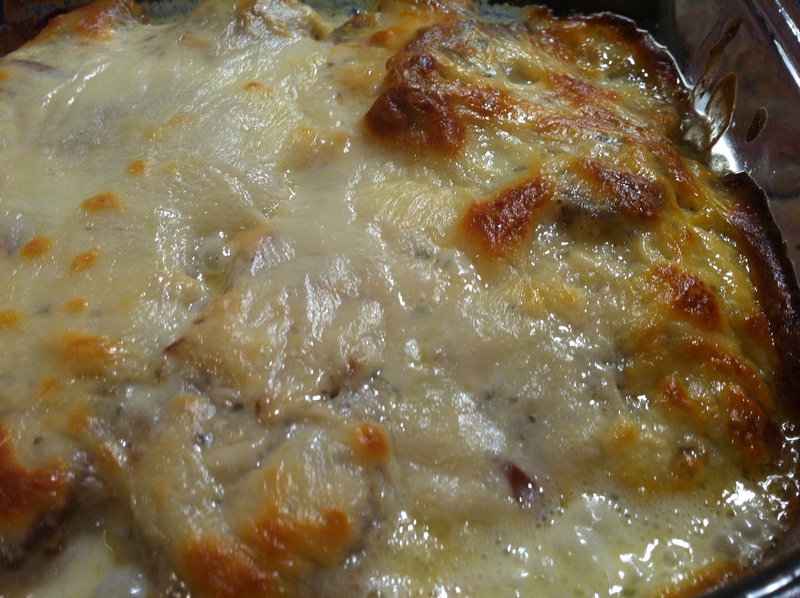 2- Gradually add cheddar and Gouda cheeses, stirring until cheese is melted; remove from heat. **Except I didn’t use any cheddar. 1- You’ll need three bowls: 1 to flour the veg, 1 to beat the eggs in, a 3rd to use for breadcrumbing your veg. Heat oven to 375ºF. 2- Dump flour in a bowl, drop veg in and toss gently to coat. 3- Toss your breadcrumbs and grated cheese in your third bowl. 4- Shake the veg to relieve it of the excess flour, then roll each piece in beaten egg (bowl #2), then drop into the breadcrumb mixture (bowl #3). 5- Lay out the breaded veg on an oiled baking sheet. Shpritz with some cooking spray and put the sheets in the hot oven. 6- Bake everything for 20min, then flip all the pieces over and baked for another 20 or so – until everything is crispy. 7- In the meantime, make your white sauce (see recipe above). 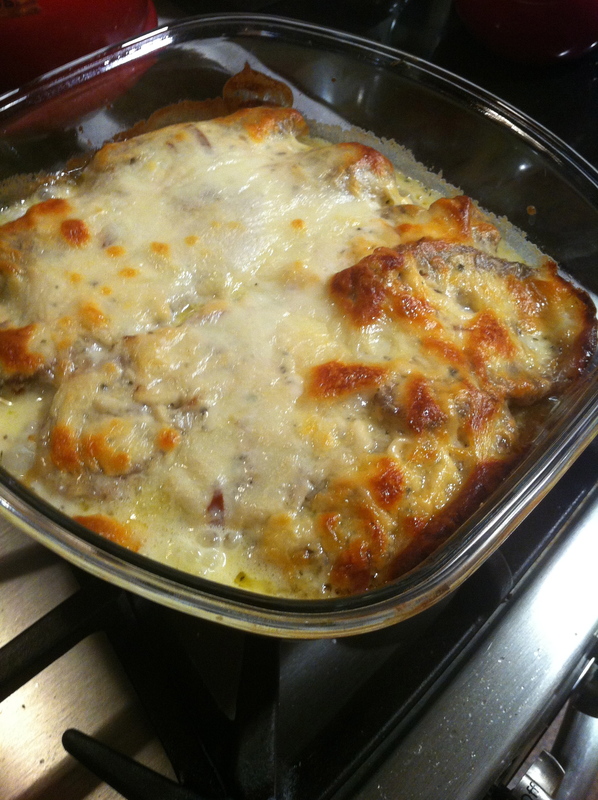 8- Using a medium sized casserole dish, you’ll layer everything thusly: cheese mix, eggplants, cheese mix, zucchini, cheese mix, eggplant, cheese mix. 9- Slice half a block of fresh mozzarella and lay pieces on top. Whack the whole shebang back in the oven for 30-40 minutes, til it is all gooey and melty and brown on top. If you were here I’d TOTALLY share this with you.